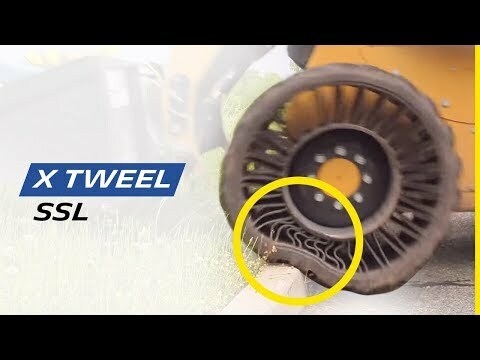 MICHELIN X TWEEL SSL is one single unit, replacing the current tire/wheel/valve assembly. There is no need or complex wheel/tire mounting equipment. Once they are bolted on, there is no air pressure to maintain. Productivity can be increased because the MICHELIN X TWEEL SSL provides greater stability and enables a skid steer to work faster with more comfort for the operator, reducing driver fatigue while improving productivity. The MICHELIN X TWEEL SSL delivers a consistent footprint with strong wear life that is two to three times that of the pneumatic tire at equal tread depth. Additionally, the unique energy transfer within the poly-resin spokes reduces the “bounce” associated with pneumatic tires. MICHELIN X TWEEL SSL performs like a pneumatic tire, but without the risk and costly downtime associated with penetrations and impact damage.